KIX Steve Whiteman (lead vocals), Jimmy Chalfant (drums, vocals), Ronnie Younkins (guitars), Brian Forsythe (guitars) and Mark Schenker (bass) are one of the bands that are about having a good time and giving their fans their money’s worth. They are loved by the fans for putting out great music and a great live show. In Baltimore, MD there is nothing better than seeing a KIX show. KIX were preparing for their annual KIX MAS show at Rams Head Live in Baltimore, Maryland. It was a great sold out show with fans bracing a cold December night to see their favorite band put on a great show in their hometown. 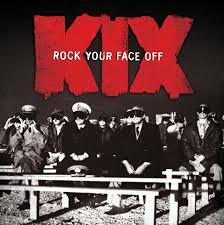 I was able to sit down with Steve Whiteman to talk about the new album Rock your face off and what’s ahead in the future for KIX. Angel Alamo: The band has been playing 5 songs off the new record was there any concern about the fans not responding to the new album? Steve Whiteman: Initially yeah. I thought we would sort of add them in slowly. We started out with just two then we threw in another one, then after a couple of months another one, then another one, it was a slow feed for the new music. But we feel that it was important to let people know that without new music there won’t be a future for us or any other band. So give it a listen, give it a shot, maybe you would want to buy the whole damn CD. It’s important to make them understand that we have to play the new music and its fun for us for not having anything out for 20 years. Angel Alamo: How did you guys come up with the title for the new album and were there any other titles for the album being considered? Steve Whiteman: I was reluctant for the title. I wasn’t really a big fan of calling it rock your face off. I thought can’t stop the show would have been a much more appropriate title but we have a song called rock your face off and apparently there was banter going around among management, record company, and Mark Schenker who was in charge of doing mixing and help set up the record deal. They just went ahead and thought we would all be ok with it. Now, that it is all set and done it doesn’t really matter. I wasn’t a big fan of it initially. Angel Alamo: While the band was in Pre-production was there any expectation for what direction the band would take on making the new record? Steve Whiteman: That’s the biggest reason why we brought in (Producer) Taylor Rhodes. Taylor knew the band well, worked with the band, worked with our ex-songwriter, produced and co-produced a couple of our later albums. We knew having somebody that understood the direction of the band would keep us in that direction. He had a lot of great advice and he brought in some songs. He revamped some of the songs that we brought in and all decided these would be good candidates for KIX songs. He helped us keep it in the mold. Angel Alamo: Being it was 19 years between albums did the band feel nervous about putting out Rock your face off? Steve Whiteman: No not at all. Once we realized after we got together and did some pre-production. We first thought about doing it we threw so much material at Taylor like 25 songs he narrowed it down to 12 songs. When we worked on those 12 songs we came away feeling really good about it. Then a couple of songs like rock me with your top down and can’t stop the show came in as later additions on top of what we worked on and we felt that we had a pretty strong record. Angel Alamo: You have fans from all over the place on your Facebook page I see fans asking for you guys to come out west. Any chance of the band heading out to play other places? Steve Whiteman: We have done the Whiskey. We did the Whiskey this past summer. It has to be worth our time, it has to be worth the money to run around the country. We have a really great agent who keeps us pretty busy during fly days. The fly days have to be lucrative. We don’t just go out to play because we want to build a following we are way too old for that. We try to hit places that we know are interesting. We haven’t been in the Chicago or Detroit area in a long, long time. We haven’t been in Texas in a long, long time. We are working on that. I know we are going Texas next year. I know we will be back in California we have a lot of fans out there. Angel Alamo: Who came up with the cool addictive chorus to love me with your top down? Steve Whiteman: Mark Schenker. I was in a band called Funny Money. We had a guitar player named Rob Galpin in Funny Money great guitar player, great songwriter, and good friend. Mark and Rob played in a band before they got into Funny Money. They have always been a good songwriting team. They get together to write songs to get into movies or television shows they always write all of the time. That was one of the songs that they came up with. Angel Alamo: Inside outside Inn is a good song on the record what is the song about? Steve Whiteman: That is sort of the biography between me and my wife. We have been married for 32 years. As you age and beauty fades a little bit and time takes its toll. It’s the same person that is inside. When you fall in love you got to love them inside and outside so that is where the song title came from. It’s a little biography of our life together. Angel Alamo: Wheels in motion is the fastest tempo song on the album was that done on purpose? Steve Whiteman: Probably. That is one of the first songs I heard. I was blown away by that one. That was another Mark and Rob song. As soon as I heard it I am like that is the direction. Angel Alamo: Did you ever wonder would you run out of breath singing wheels in motion? Steve Whiteman: I do when we were recording it. It took training for me to be able to do that song. Every night I have to tell myself slow down don’t move around so much. Angel Alamo: Is wheels in motion a song about cars? Steve Whiteman: It’s actually about gossiping. Stepping on people’s toes, people getting offended once something gets out there wheels start turning its gets blown out of proportion. It’s not really a song about cars. Angel Alamo: How do you keep your voice in great shape? Steve Whiteman: I teach vocals so I took training. I know how to protect myself and keep myself strong. Sharing that with people for the past 20 years has kept me really strong so I have been fortunate and I work really hard at it. Angel Alamo: Was there any songs on the album that took long to write and record? Steve Whiteman: Not really. We tweaked them. Once Ronnie and Bryan got involved and put their style into the riffs that I had written and the ones Mark and Rob had written, they KIXsize them. that is when they start sounding like KIX to all of us. 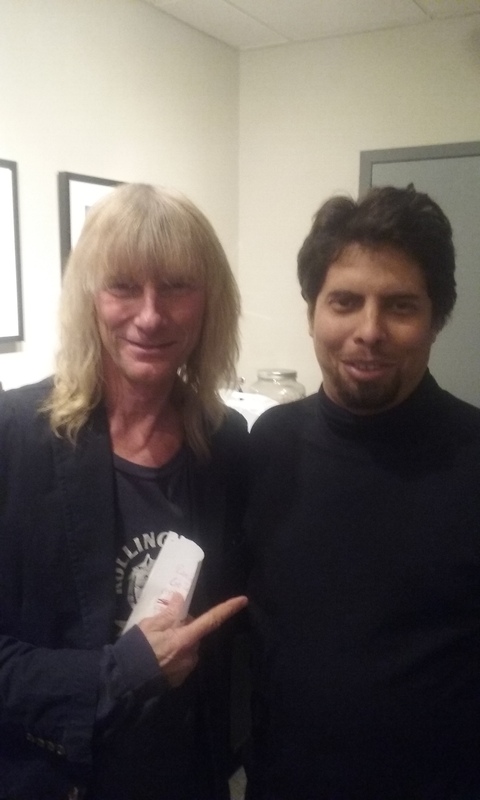 Angel Alamo: What has been the key to the band’s longevity, music wise you never follow the trends, you guys are like an AC/DC where the band just wants to rock and put on a great show? Steve Whiteman: Exactly, we are about fun, we are not preachy. We are not going to tell people what to do or how to live their lives. We are not going to glamorize politics. We are about let’s get a beer, let’s pick up a girl, let’s get f*cked up and have some fun. It has always been about having fun. People come up to me sometimes and say my friend just passed away can you give him a shout out on stage. I’m like no, that is not why people are here. People are not here to be bummed out. They are here to have a good time. They want to forget about that stuff. That has always been our approach, have a good time make the people have a good time and forget your troubles for a couple of hours. Angel Alamo: Can fans expect a new album next year or in 2017 or will you release an E.P or put out singles? Steve Whiteman: We’re now just starting to think about another record. We are not shooting it down. We got to look at what the logistics of what the last one did. If it’s just a waste of time. Records don’t sell anymore how many people are downloading it we are not sure. How many people are stealing it we don’t know. We don’t even care we just want the music out there so we can go out and play it live. If we go and try to play new music and they don’t know what the hell it is then it’s no fun. For us we would love to do it but it’s got to make sense. We have to find a way to hit the people and make them want to buy it. It isn’t just us it’s everybody having trouble with record sales. A lot of people have just given up. 20,000 is considered really good. 20,000 is a piss in the bucket compared to what we used to do. We used to do 80,000 alone in Baltimore/Washington area alone back in the day. Those days are gone, long, long gone. My new favorite song from the band. Thanks for reading my interview.